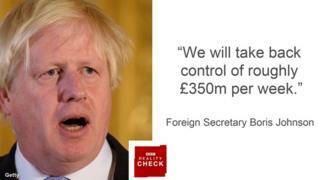 The claim: Foreign Secretary Boris Johnson stated in an article for the Daily Telegraph on 16 September that "once we have settled our accounts, we will take back control of roughly £350m per week. It would be a fine thing, as many of us have pointed out, if a lot of that money went on the NHS". Reality Check verdict: £350m per week is an approximate sum for what is called the UK's "gross contribution" to the EU and does not take into account that the UK is given a "rebate" before any sum is paid to Brussels. The UK has a veto over the EU long-term budget including changes to that rebate. The money never leaves the Treasury and the government can control how it is spent. It would be up to the government to decide how they want to fund the NHS after Brexit. A key phrase in Mr Johnson's article is "take back control". This is a change from the slogan used in the 2016 EU referendum campaign which claimed that "we send" £350m per week to the EU. But does the language Mr Johnson is now using make a difference to the debate? To use the most up to date calendar year figures, published by the Treasury, in 2016 the UK's gross contribution to the EU was calculated as £327m per week. But the whole of that sum did not leave the Treasury's coffers because before anything was paid to the EU, the UK's rebate of £75m per week was applied. The total sum sent worked out at £252m per week. The rebate is easiest to understand as a percentage discount and comes up for discussion every seven years when the EU long-term budget is negotiated by EU leaders. It was negotiated by Prime Minister Margaret Thatcher and came into effect in 1985. All 28 EU countries, including the UK, have a veto over that long-term budget. That makes discussions very tough but it does mean that if the UK is unhappy with anything, including the rebate, it can prevent it from being approved. What was behind Boris Johnson's Brexit article? The long-term budget sets the maximum amount that can be spent over the seven-year period. Every year the amount the UK sends to the EU will be slightly different and the UK does not have a veto on this. But it cannot exceed the payment ceiling set by the long-term budget which the UK approves. When Tony Blair was prime minister, the UK parliament voted in favour of a reduction in the rebate as a proportion of our contribution to the EU budget. This was in support of the enlargement of the EU. Mr Johnson's article is different from the 2016 referendum bus line which said 'We send the EU £350m a week, let's fund the NHS instead' . He asserts that "once we have settled our accounts" it would be a "fine thing" if "a lot of that money" was spent on the NHS. That would be up to the government to decide. Currently the Treasury receives some money back from the EU for projects in the UK. In 2016 the Treasury received £87m per week. This included farming subsidies and regional aid. The EU also makes some payments directly to the private sector in the UK, for example to universities, research institutions and others. In 2014 (the latest year available) the Treasury estimated they totalled around £19m per week. When the UK leaves the EU the government can decide whether to continue funding those projects or not.